Powerful thunderstorms moved through Minnesota on a steamy Sunday afternoon in July 1890. A huge tornado, later immortalized in a Julius Holm painting, churned across Kohlman Lake, “a little summering place” in what is now Maplewood. At least seven people were killed and dozens injured. That evening, about 70 miles to the southeast, on Lake Pepin, a much larger tragedy unfolded. 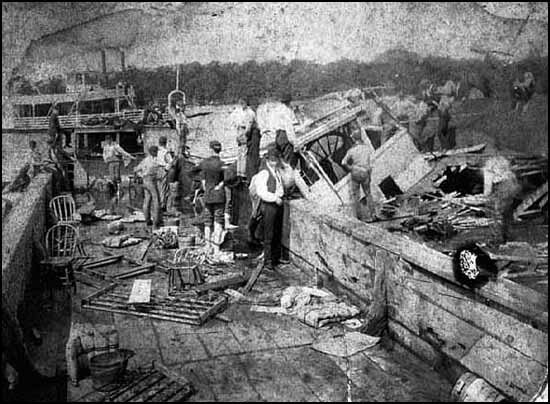 A “cyclone” blew in from the west, capsizing a steamer carrying more than 100 passengers and crew up the Mississippi River. A Minneapolis Tribune correspondent who happened to be on the scene told the tale in gripping — if maddeningly chronological — fashion. An Awful Disaster At Lake Pepin, Minn.
A Steamer Capsizes With 150 People Aboard. The Wind and Waves Have no Mercy on Them. Only Twenty Succeed in Saving Their Lives. People Watch the Awful Struggle From the Shore. But No One Could Lend Any Assistance. The Storm Drowned the Cries of the Unfortunates. A Disaster Never Before Equaled in the Northwest. LAKE CITY, Minn., July 13. – [Special.] – What may prove the most disastrous storm in many years passed over this place this evening killing probably 100 people and damaging property to an extent that at this writing cannot be estimated. Your correspondent was visiting friends in Lake City and was sitting in the yard when what appeared to be an ordinary electric storm was noticed coming up from the West. In half an hour the whole heavens were converted into a complete canopy of lightning which was watched with interest by the brave citizens of the little village and with fear by the timid women and children. A little before dark a terrific wind struck the community and your reporter sought the shelter of the house just in time to escape being caught under a huge tree that came crashing down against the house. Windows were closed instantly and none too soon, for the cyclone was upon us and trees and houses were fast being demolished in its path. Those on the barge remained there until they were drifted nearer the shore and they were all rescued or swam ashore. Among them were two ladies who were brought to the beach by strong and ready swimmers. There were about 50 in all that were on the barge. The events that transpired on the steamer after it separated from the barge are probably most clearly stated by those who were rescued from it about half an hour ago. It is now 12 o’clock midnight. As soon as the [storm] had begun to affect the progress of the boat, Capt. Weathern [Wethern, actually] gave instructions to run the boat into the Wisconsin shore but it was a too terrible force of wind and wave. In five minutes more the waves began to wash into the boat and fill its lower decks, and while hailstones as large as hen’s eggs came down on the heads of the poor helpless creatures which were huddled together on the top, a huge wave struck the craft on the side at the same moment that a terrific blast of wind, more horribly forcible than the others, came up and carried the boat over, all of the people on board; 150 or more were thrown into the water, some being caught underneath and others thrown into the waves. Those remaining began calling for help from the shore as soon as the storm began to abate and in half an hour lights were observed flitting about on the pier at Lake City, opposite which point the upturned steamer had now been driven. Before help could reach them, however, the creatures who remained to tell the horrors of the night were again submitted to another battle with the elements, with no word of warning; and as they were just beginning to hope that they would be taken off by the citizens of Lake City, the boat again turned over, this on its side and again all of the 25 remaining souls were hurtled into the water. Of these several were drowned before they could be brought to the boat by those who succeeded in remaining afloat and again securing hold of the boat’s side. As the men hung on to the railing, in danger each moment of being washed away by the waves, one man observed the forms of two women wedged in between a stationary seat and the boat’s side, both pale in death, as the lightning gleams lit up their upturned faces. Another man saw two little girls floating past him as he hung with desperate efforts to the steamer’s side. Clinging to the boat were rescued and brought to the shore, most of them being men who could swim. Among those who are known to have been on board the steamer and who are undoubtedly drowned are: Two children of C.H. Reberick, Peter Goken, his wife, five children and hired girl, Fred Sebes, wife and daughter, Mrs. Capt. Wethern and her two children, F. Christ, Wm. Blaker and family of three, Mrs. Hempting and daughter, Gus Beckmark; a Miss Flyn, Bose Adams and Ira Fulton. A full list of the 150 passengers, which are pretty certain to have been drowned, is not obtainable at this writing. A large majority of them were women and children. Those being saved being nearly all strong men, who were able to swim, and cling to the boat, after it had capsized. On the return from the capsized boat with three or four people who had been rescued, one of the row boats encountered two floating bodies, each with a life preserver attached. In Lake City the damage to property by the cyclone is great, although no fatalities have been reported. Collins Bros.’ saw and planning mill is totally demolished. The roof of the opera house, owned by Mr. Hanisch, was carried away and the stores underneath more or less damaged by the rain and hail. Up to this time, 1:30 a.m., 62 bodies have been found and laid out. 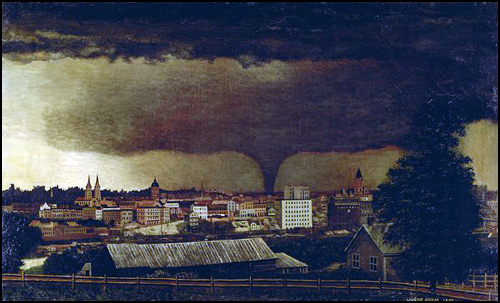 Julius Holm's 1893 oil painting shows the Kohlman Lake tornado as it skirted the edge of St. Paul.